It is a good article, and all it does is piss me off because it reminds me of how dumb our coaching is. 7-2-1 and miss the playoffs is a JOKE. Go ahead. Pour more salt into the wound. Remember the Christmas 2016 game won with AB’s stretch into the end zone? I happened to be watching it...and we have Kyle Juszczyk to thank that we ever saw those heroics. 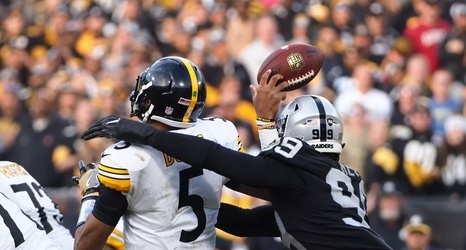 Because had he not struggled to get into the end zone in the TD that put the Ravens up 27-24, we might never have seen a final Steelers’ drive...because it was the EXACT same situation as the Raiders’ game. Steelers were clinging to a 24-20 lead and had two timeouts left and the Ravens were inside the ten...and Mike Tomlin was doing the EXACT same thing...letting the clock tick away instead of saving time for his offense should it be needed. Had Juszczyk fallen down short of the goal line, Tomlin may very well have let the clock tick away as the Ravens scored the winning TD. He has done this over and over and over again. Surprisingly, he DID call TO's against the Saints late when they were about to score. I don't know if that means he's learned his lesson or not. I still say we need to build a monster defense so that Tomlin can count on his D to stop teams from scoring when they get to our 6 yard line. How about we fire Tomlin and then build that monster D? Kevin and Art have not elected to fire Tomlin this year, so I'm working wtih what we have.